If you haven’t noticed lately, the western world is on a bit of a coconut oil kick. It’s in all the popular blogs—from nutrition to hair care—and it’s no longer difficult to find a few different varieties of the oil in normal grocery stores. This is a good thing. Coconut oil should have never been demonized, as it was, and deserves a top spot in the natural health world. Several decades ago, coconut oil was vilified. It was made to look like the “bad guy” in comparison with its competitors from the corn and soy industries. They were successful in their campaign to squash the coconut oil competition by highlighting it’s saturated fat content and tying that to heart disease. Now, however, coconut oil and its medium chain triglycerides (saturated fats) are back on top and being recognized for numerous health benefits. The health benefits of coconut oil are amazing; the oil possesses antimicrobial, antifungal, anti-bacterial, and antioxidant properties. The lauric, capric and caprylic acids within the oil are credited with many of these benefits. It’s the lauric acid, for instance, that is converted into monolaurin which in in turn fights the bugs associated with herpes, giardia, listeria, influenza, and even HIV. Coconut oil benefits truly are many, and it doesn’t take much. Just a tablespoon or so a day could make significant differences in your health. Coconut oil for Alzheimer’s and dementia has been proven especially beneficial. 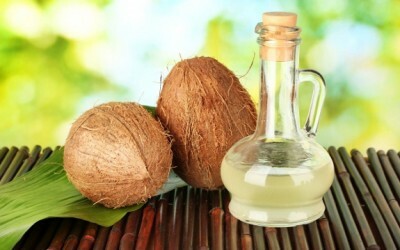 Topically, coconut oil can be used on the skin and hair. For your skin, it’s great for soothing dryness and even irritation from rashes. It is also good for fighting wrinkles and signs of aging. Common skin disorders like psoriasis and eczema can be taken care of, along with simple chores like removing eye makeup without the use of chemicals. Used on your hair, coconut oil can increase shine and reduce static electricity. It can also be used as a scalp massage to eliminate flaking and itchy dry scalp. Best of all, coconut oil is easy to add to your daily regimen. Use it in sautéing vegetables, raw in smoothies and juices, and in your baking and cooking. It’s flavor goes well with sweeter dishes but can temper a spicy dish just as well. hi, I could coconut oil to be very useful for my skin. however, I’ve been buying it from a health food store that is a far distance from my house, what website is your brother ordering from? I cook extensively with virgin cold pressed coconut oil as well as taking 4 tablespoons a day orally. We do a duck confit in coconut oil rather than ducks fat, its delicious! My wife uses it for hair loss too! It’s really a miraculous natural product with many many benefits. My local WalMart carries this. It is on the baking section with the other cooking oil. It is better price & is organic cold pressed. Who says butter is bad? There are studies that assert either stance. You are absolutly right, Larry Heisler! There is nothing healthy about coconut oil. The are no healthy oils, period! I just have a question that is not related to coconut oil. I would very much appreciate it if anyone can answer my question. When I was a child, my family always bought watermelons which were large and full of seeds. Today, I saw one of our grocery stores advertise ORGANIC, Seedless Mini Watermelons. I always remember the day when watermelons used to be large and full of seeds before they were Genetically Modified. Is there such a thing as an "ORGANIC" Seedless Mini watermelon. Synchronicity! I woke up this morning trying to think of a good cooking oil besides Olive. Thanks, Natural Society. Does anybody know a good place to find this on the internet? My brother buys a lot of it off the net at a really good price. I think he gets it in 5x1L jars. Good stuff and smells like those coconut chocolate bars. May I add that you should buy non-hydrogenated, raw, cold-pressed, organic coconut oil (it liquifies above 76 degrees). Check out Dr. Mary Newport on google or YouTube for her husband's experience with coconut oil. [ Smiles ] We use a lot of coconut oil here in the Caribbean.